Down below, the 349 is more like a 38-footer than its 33 feet. 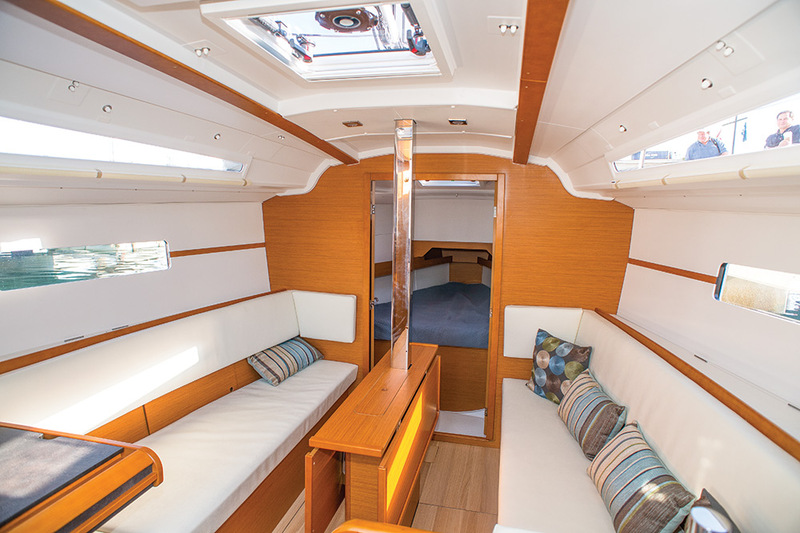 The 349 interior is a perfect example of how seemingly subtle hull-design changes can dramatically improve livability. Once again, you have to remind yourself that the 349 has an LOA of just 33 feet 11 inches, or just over 10 meters, the interior seems to have the elbow room of a 38 footer. There are two hull design concepts that affect the interior. The aforementioned chine in the hull creates more volume to the aft cabins and what used to be called reverse sheer, but now is termed positive sheer by Lombard and Jeanneau, means that the hull line actually arcs ever so slightly up from the ends, giving the center of the boat a higher deck line, more freeboard, and more volume below where you really want it, in the saloon. While there’s nothing new about this—powerboats have done it for years—it requires deft design and construction to make it visually appealing in a sailboat. It works brilliantly on the 349. There are two interior plans available. Our test boat was fitted with a single aft cabin, large aft head and separate shower. The other plan calls for two aft cabins and a smaller head. I like the single large aft cabin layout because it also allows for a large cockpit locker that can house everything from spare sails to fenders. Of course if you are looking at the 349 as a family cruiser there’s nothing like privacy and those aft cabins will keep the kids happy. My kids were never happier aboard than when they had their own cabins. With either model, the L-shaped galley is to starboard when you drop below. There’s plenty of counter space with decent fiddles, a single sink on the centerline assuring good drainage on either tack and a large top-loading fridge. The two-burner stove and oven are outboard. Lockers above the stove are relatively shallow but there’s also storage below. A microwave is a popular optional. The saloon features a centerline table with fold up leaves and straight settees to either side. 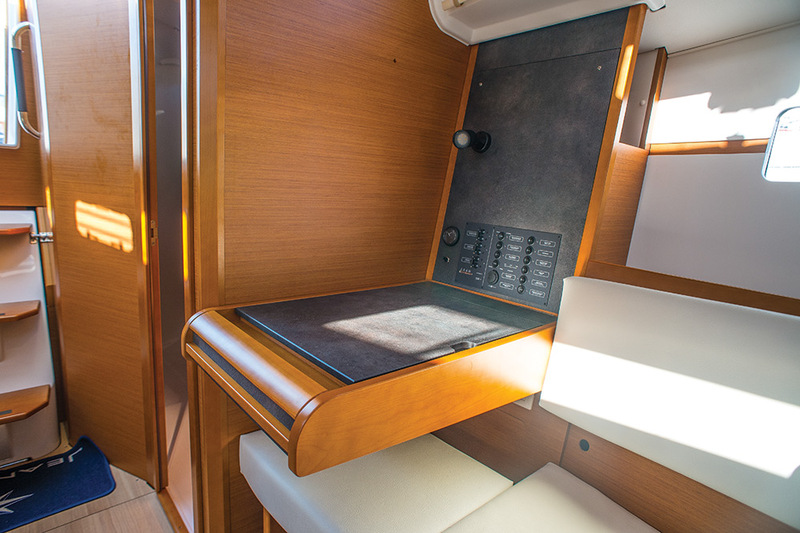 There is plenty of natural light from overhead opening hatches and in-hull port lights. The light teak interior contrasts nicely with white overhead panels and also helps brighten things up. The nav station is to port, and I applaud Jeanneau for sticking with the concept of a nav station. A working desk is still a critical component of the any sailboat interior in my book. The settee below the nav station is removable and doubles as a clever mobile seat when dining. The nav desk also lifts conveniently out of the way. The forward cabin is a bit tight, but the bunk will receive great ventilation below the foredeck hatch. There is a hanging locker to port and storage below. 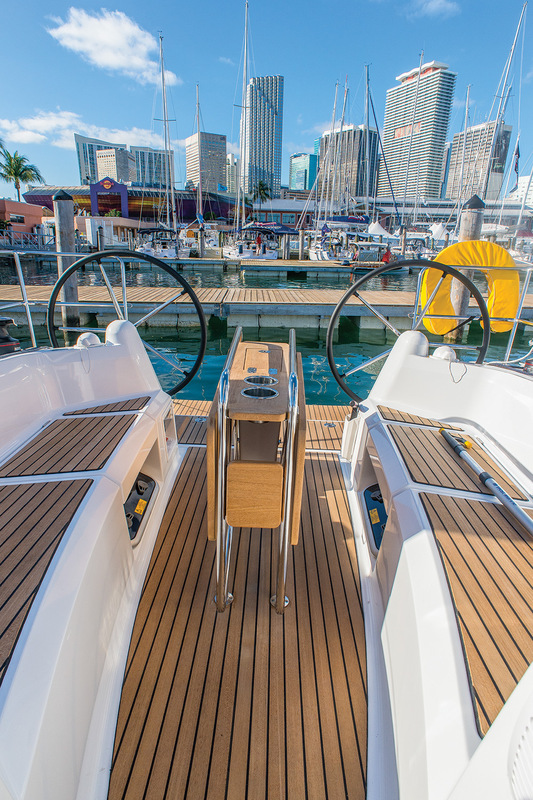 The 349 is powered by a 21-horsepower Yanmar that is accessed from behind the companionway and through ports in the aft cabin. Fuel capacity is 34 gallons, which is a season’s worth for many sailors. Water tankage totals 54 gallons. The systems are well honed, and Jeanneau’s electrical and plumbing components are reaching bulletproof status. With twin wheels, there is easy access to the transom with its fold-down swim platform.